Hai nekochan desu. Ohisashiburi ne…. Gosh I haven’t been posting for _quite some time_ ne? Gomen.. with a PC that has multiple organ failure and keeps collapsing and going into cardiac arrest every now and then, I couldn’t be bothered typing blogs. I haven’t been writing my own blog either. Anyway, what’s news… I’m starting to write the screens for A Heart That Shines chapter 3. I put it off for a while cos I got a little bored with the story. But when I started writing the screen I got all excited again, it’s hard to keep the number of pages down. This time around I want to put more effort into drawing the background and landscape, in which I’m very.. heta (lousy). But I’ll work on it. Yakusoku desu. Gambarimasu! Hopefully I’ll get my PC done up, or buy a new one soon. What’s life without our own PC, rite? 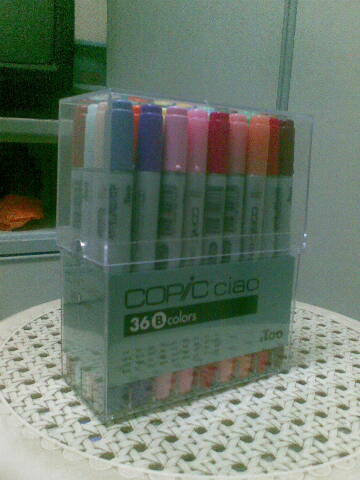 Aaaand…that’s my new set of Copic Markers. An addition to nekochan’s treasures!